Ever since it opened in 2008 in Torbiato di Adro in the heart of Franciacorta, the Dispensa Pani e Vini and its chef/owner Vittorio Fusari (above) have been what the Italians call a punto di riferimento — a landmark. As in any Italian wine-producing region, there is a lot that the franciacortini don’t agree on. But everyone in Franciacorta sees eye-to-eye when it comes to Vittorio and his fabulous restaurant. From the dealmakers and power brokers to the cellar rats and everyday punters, everyone in Franciacorta seems to love this place, whether for an aperitif before heading home for dinner or whether a night-to-remember in the venue’s main dining room. And it’s not just because the food is unbelievably good: It’s also because Vittorio’s charisma and his commitment to his land and appellation are virtually unrivaled. 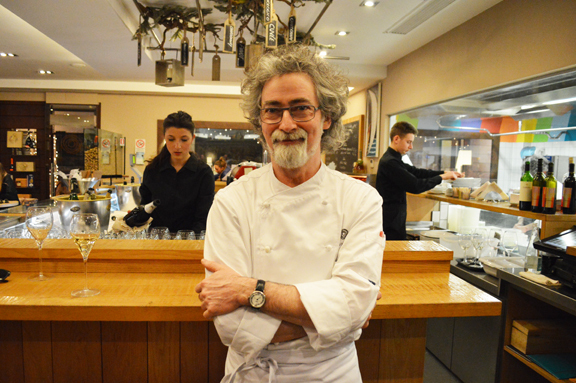 And so it was with heavy hearts that a group of wine professionals and I gathered their on my second night in Italy last month: In mid-March, Vittorio announced that he was accepting a new position as executive chef at the storied Pont de Ferr in Milan. He won’t be abandoning the Dispensa, he told us. But he will be devoting most of his time to his new gig there. Everyone was a little blue by the time that our aperitif ended that evening. We’re all going to miss Vittorio and the energy that he infuses into all of our lives through his vibrant, wholesome cooking. We know that he is going to help raise awareness and visibility of Franciacorta through his work at the Pont de Ferr, a Michelin-starred restaurant in one of the world’s capitals of gastronomic culture. But it’s also kind of like the day the music died. Previous post ← Happy Easter from Franciacorta, the real story!